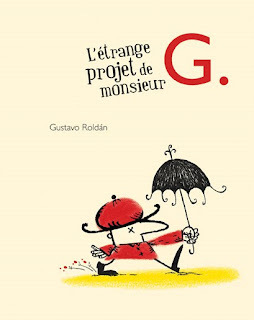 Today I shall introduce two new picture books published by Sarbacane respectively in January and February: "Coline" and "L'étrange projet de Monsieur G.". 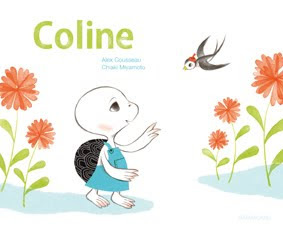 Coline is a story about the friendship between a swallow, Coline, and Youyou, the turtle. The two friends are inseparable, they happily play hide and seek on the beach, but autumn is incumbent and Coline starts feeling a strong instinct to abandon the country to migrate south. Youyou feels so sorry, she can't stand the idea to loose her friend, even if she knows that one day Coline will come back. What could she do then? Maybe she could take a little souvenir of her friend, to warm her heart up during the long winter? Maybe a small feather, that smells of her, but will one feather be enough? Maybe two would do better than just one... Pushed by the wish to keep her friend close to her, Youyou doesn't fully understand what she is doing: poor Coline, who was so happy for the upcoming departure, will be quickly left featherless and she won't be able to leave as she had planned. Why, why did my dearest friend do this to me? She will ask herself. Youyou will have to find a solution to for the damage she has caused, and maybe she will as well find a way not to separate from her darling friend. The power of friendship and the sadness caused by abandonment are the two topics that characterise this picture book for younger kids. The feeling of possession that Youyou feels doesn't allow her to immediately understand the hill she's doing to her friend and, maybe, in every friendship there is a moment like this, when we grow older as well. This story tender and melancholy teaches us that we can't just think of ourselves, of our feelings, on the contrary we should think of those we love, to protect them from our small or big selfishness as well. And if we do something wrong we should try to find a remedy for it, with the means we can count on and with pure heart. As I was just saying, this is a lesson that is good at all ages, because friendship is probably the purest feeling we could ever feel, as it's not ruled by relative bonds, or from other impulse other than selfless love. This little picture book, full of poetry, is the result of the collaboration between two artists quite new to children's literature but already widely credited. Alex Cousseau, who started his career in 2004, has published with l'Ecole des Loisirs, for Le Rouergue he has written novels for kids and teenagers, and now Sarbacane publishes this picture book. His picture book titled "Dans moi', illustrated by Kitty Crowther, has been published in Italy by Topipittori Pub. House. Chiaki Miyamoto, born in Osaka, lives in France since 2000, in 2003 she gets her degree at Emile Cohl's School in Lyon where she still lives nowadays: she has published several picture books with Gallimard Jeunesse, Belem, Nathan and Milan. Of this book I have admired the gentleness and the sensibility of both, author and illustrator, dealing with the themes of friendship, touching the deepest reasons that lead us to behave incorrectly at times but also underlying e importance of opening mind and heart, in the effort of understanding the reasons of other people. The illustrations, in their essential simplicity, enter the story quietly, to win readers' attention with the sober and soft lines and the bright colours. From three years old on. Le me start by saying that, in this book, there is no reference to our Mr G. (Il Signor G. a.k.a Giorgio Gaber). Even if maybe, Gaber himself, would have appreciated its message, the surreal setting and that vein of madness, if madness is the right word, that animates this Mr G.
But let's start from the beginning! Gustavo Roldan lives in Barcelona, and this could partly explain the flowery taste of some of the illustrations of this book, but he was born in Argentina, and maybe from here come its boundless spaces. Until, one day, Mr G has a queer idea. His wise neighbours know for sure that no flower can rise in the desert, and flowers can't make any music for sure, Mr G. must have grown a little mad. What will happen with the seed that has been planted? Will it grow? Will it sing? I shall let you find the answer yourselves. 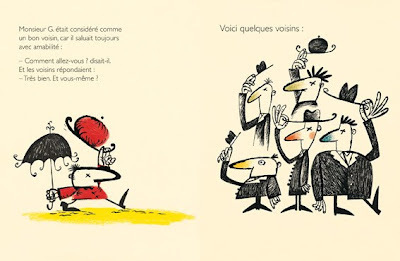 The apparent playfulness of the book, with its illustrations and their slightly stereotyped and ludicrous côtè, the light lines and the white background, hide a very serious message: personal initiative, when it's devoted to improve human condition, can change also those situations that are apparently lifeless. Didn't a precious flower grow on Saint Exupéry's desert moon? Thus, maybe, even if we look like mad at other people's eyes, we can try to grow our own sounding flower in the desert and, if it ever blows, who will be mad then? Idling won't help change things, therefore our Mr G., with his likely desperate gesture, starts a little civil revolution that will bring to an unexpected and welcome changement in his village. To each one of us his own choice: are we mad or wise? Copyright© text and images by Editions Sarbacane 2010. Images have been reproduced with the permission of the Publishing House. * "bring some music in this place"
Thanks a lot for reading my book with atention.